Stroopwafel, as it is known in Holland, is a unique type of cookie that has been around for centuries in its native country the Netherlands. It is a traditional daily treat for the Dutch and is mostly eaten with their morning coffee or tea. The Syrup Waffle (Stroopwafel) is still sold and made the traditional way, at local open air markets using propane powered cast iron grills . As the delicious scent travels through the market, the customers line up with their mouths watering. Traditional Syrup Waffles (Stroopwafels) are made with two thin wafle-type wafers that have a very special caramel filling. Sometimes hazelnuts or honey, or other flavors are added to the filling. The waffle is cooked at a very high temperature on a waffle iron then sliced in half. The syrup then spread on and the two halves come together again. The best way to eat a Stroopwafel is either at room temperature, or to heat it in the microwave for just a few seconds. These delicious Caramel Cookie Waffles (called Stroopwafels by the Dutch) with richly filled chewy centers are one of Holland's true specialties. Did you know.... that every Dutchman eats about 20 Stroopwafels a year! Cut one (1) cup of the butter into the flour. Mix in the sugar, cinnamon, eggs and yeast mixture. Mix well and set aside to rise for 30 to 60 minutes. Roll dough into 12 small balls, squeeze each ball into the preheated pizzelle iron and bake for about 30 seconds. Cut the wafels into two thin wafels and spread with filling. Tip: Try eating your stroopwafel by resting it over a warm cup of coffee or tea...the steam will warm these up just right. I used to have stroopwafels as a kid in Holland, and ever since moving to the United States, stroopwafels have become one of the biggest things I've missed about Holland. They simply beat just about every other treats. They're not really waffles in the traditional sense. Does anyone know where I can purchase the stroopwafel iron? because I really miss it but it's too time wasting to buy from Holland. I am considering making it on my own. How do you slice the pizzelle? When we made ours the cookie was to thin. these were much easier to make than expected. after being in Holland for 2 weeks, stroopwafels were one of the first things everyone missed. Hi, Once a friend took some Stroopwafels from Holland,same as http://www.dcimports.com/fourseasonstin.html,the taste is just great. I want to import to China, could you give some information? Awesome syrup! You can also get stroopwafels from www.marinamarket.com in Washington State. I adore stroopwafels... I had them when I was living in Holland as a small child... now, when I stay with my Dutch grandmother, she always stocks up on them for me, and when we visit the Netherlands, we also come back with several large packets of large and mini stroopwafels! I got hooked on these because my employer has an office in Amsterdam and the employees keep giving me these as gifts. I have since purchased an iron and am in search of great recipes, and this one is very tasty. My wife is going to try the filling on top of ice cream -- she loves it. Stroopwafel is one of the best desserts around. Just to let you all know, you can buy a Pizzelle iron at most Wal-mart stores. I bought mine off eBay, then saw one for sale at my local Wal-mart a few weeks later. This is a great recipe...could I make it without the iron? is there another way? Hello, Just bought these stroopwafels at www.hollandsbest.com. Holland’s Best, also known as Holland Pastry & Gift Shop,in San Jose, California. They're good, but the ones I'd get in Holland are more moist, soft, and chewy. Also the caramel inside has a granular feel. I bought a candy thermometer to try to make it smoother, but not much luck. Any ideas out there in the stroopwafel world? Thanks, L.
Any idea of the number of calories per waffle and the number of grams of fat? Thanks. If your filling is grainy that most likely means you haven't melted your sugar properly. When your sugar is boiling you have to take a brush or a wad of soaked napkins and wash the sides of the pot so that there are no granules of crystal sugar to inoculate your caramel, causing a grainy texture. I will definitely have to try this recipe. Looks fabulous, hazelnuts especially sound good. I found a mini waffle cone maker that has 3 circles on it and looks like it would make a fabulous stroopwafel. It's called the "Chef's Choice International PetiteCone Express" I can't wait to try it out! This is a very good recipe...I can't compare it to any other as this is the first time I have made and tried stroopwafels. They looked just like in the picture. We bought the Palmer iron for stroopwafels. The kids loved them! We just received a package of stroopwafels from our son and daughter-in-law who are living in the Netherlands. After one cookie, we are hooked! I love Stroopwafels they are a god send when you get out of the chilly Amsterdam wind. Hooked on the things for at least a couple of months after I return home to the UK. Just as a matter of interest they are very popular in North Wales and have even argued with locals about their origins lol. Question... this is not, i repeat, not a spam thing...LOL... By the way, Hi everyone!!! Okay, I am going to start a Stroopwafel business in the U.S. and am testing new flavors so I need some feedback, and you guys sound like the experts at the tasting department. What do you think of caramel-pecan-chocolate....peanut butter-honey.....and chocolate chip stroopwaffles? My friend and I are recently disabled and we love these cookies and are excellent bakers but need to begin a new line of work, so any feedback would be greatly appreciated. Thanks and have a great day! Greetings from South Africa! A dutch friend of mine has asked me to find out where he can purchase a stroopwafel maker/iron! In doing some research on the internet it seems the syrup-waffle is not really dependent on a specific type of iron but more on the recipe and the filling and cutting it properly to fill, is that correct? If so, does that mean that he could buy just any waffle maker? Your help will be much appreciated!! Maybe I'll even get to taste one of these remarkable treats! These look very tasty! You can also buy them at Trader Joes. They are pretty good. Although, my husband is from Holland and when his family come to visit us they bring the real thing and you just can't beat that. Thank you! I'm a Dutchy, living in Sweden, and no Stroopwafels here either!! Hello everyone, my dad’s side of the family is Dutch and we grew up in MN with syrup waffles but we called them Strookenipers (don’t know about the spelling) but the iron we used has about a 3 foot long scissor type handle with a very decorative cookie press that we used on a gas stove. Has anyone else seen or heard of these. Thanks and have a great day. 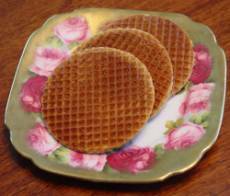 A Dutch family in Billings, MT makes stroopwafels; try www.caramelcookiewaffles.com They ship anywhere! I LOVE these, but not many people know of them. Thanks for the great recipe! What would be the best maker to use: a Pizelle maker or the Krumkake maker? Thanks! Strookeniepers are speeled knieperkes and are made in Twente (east Holland) . They are not supposed to have the syrup filling! Anyone out there who is familiar with the real Syrup made out of Beet sugar? The English have some equivalent in the Golden Syrup. That eliminates the not so healthy corn syrup. Good recipe!! You are right, they are VERY famous in Holland!! Just found out that even Mcdonalds (Holland) has a Stroopwafel flurry! I like the cookies so much, but I have a question about the dark corn syrup. Did you buy it or did you make it. And also, can I use honey to replace the dark corn syrup, or not? Second question. The pizzelle iron, how much does one cost? I can use it for my business in Ghana. Your syrup/filling is very different from my grandma's that she made in her bakery in Holland, but yours is good as well. The iron your family used for "strookenipers" sounds like a Belgian lukken iron. Have not tried the recipe yet, but I'm planning on making it today. Looks good. Are you required to have "Stroopwafel Iron" to make them? Or is it possible to make them with your average waffle iron? Please return an answer I am eager to try these! @ Marthe: Stroop fabrijk (Syrup factory) "Canisius" in Schinnen, NL makes the beet syrup you are referring to. They also make a very popular apple syrup as well. You can buy it at all of the Dutch grocery stores, but not sure about where to get it in the states. These turned out yummy. I had to make some changes. Dividing this batter into 12 balls made 12 giant almost-baseball sized balls. They overflowed my pizzelle maker. I cut each one into fourths (walnut sized chunks) and cooked them in the pizelle maker. Then I sandwiched two together with filling. The later ones were easier to slice, but still pretty fussy, so I decided to go with the sandwich method. Thanks for the recipe! The "stroop" itself tastes exactly like it does in Holland! It has just the right amount of sweetness. However, the waffle part I had trouble with. It didn't come out as I imagined. Although it came close to the stroopwafels in Holland, it wasn't the same exactly. But overall, it was a good substitute for the real thing! Dana, instead of white sugar use brown (unrefined) sugar for that extra bit of taste. Also, the waffle pattern and thickness of the waffles is variable between makers. Some varieties are thicker, more crumbly, baked like cookies rather than waffles. Same with the filling. Substituting beet or reed sugar syrup for corn syrup changes the taste. I've even seen some varieties using imported maple syrup (not produced in the Netherlands, just as all reed sugar is imported too). As written, every baker has his/her own recipe and taste. While supermarket sales have largely watered down the bulk production to a few industrial processes, this is still apparent in products purchased in small bakeries and specialty shops. You're recipe is great, they taste really good, even better than stroopwafles from the supermarket in Holland. (1)Where could we buy waffle iron at Holland? What's the price of the iron in Holland? (2)Could we make the stroopwaffle by ice-cream corn iron as well? I love these. You can also dip them in chocolate 2/3 or cut them in heart shapes. Hello, please tell me where to get this pizelle iron. What is the price? Thank you. Hi, If it is possible I need your help. I have decided to produce stroopwafels in my country, unfortunately the price of the brown sugar is too high. Is there a chance to change brown sugar with the white one by mixing some other ingredients? Thank you in advance. Stroopwafels!!! I'm eating my 5th now. I wondered what the ingredients were... Weird that no other countries know stroopwafels.. i thought everybody knew. My carmel filling turned out good at first then got grainy as it cooled. I got Pizzelle makers on Ebay. VillaWare work fine. The yeast in the dough of the stoopwafel make them puff and easy to split as soon as you get them off the hot iron. If they cook they are too difficult to work with. My Dutch neighbor, told me they were great. Interesting to read that our stroopwafels (translates as "syrup waffles") are so popular abroad! One thing: they are not made with corn syrup or honey, and we don't tend to eat them as a breakfast, but more like a cookie with our afternoon/evening tea or coffee, or just as a warm freshly baked snack at a market stall. And did you know, these stalls sell bags of chunks of the cookie, poured over with a dollop of the hot syrup filling, as well? "Koekkruimels" (cooky crumbs), we call it. It's mainly for kids, as your hands get very messy and sticky when eating it! I'm rating this excellent even though I haven't made it yet - I have a few questions. I don't own a pizelle iron, nor could I find any for sale here, so can I bake it in an electric oven? What temperatures do I need, and for how long? Thanks. Incredible! Absolutely perfect recipe and exactly like the originals I’ve had in Amsterdam. I make my wafels with a ice cream cone maker I found on eBay $9.99 and it works great except I have to put a weight (antique iron) on the lid it to keep it closed. Thanks for sharing this wonderful recipe. I just love stroopwafels.. My sister who live in The Netherlands always sends some to me here in the Philippines at least once a year. I would like to learn how to make them. Are you sure this recipe is made without any liquid? The mixture was just a big crumbly ball that was not able to rise at all. We order at www.stroopwafelonline.com Delicious! !